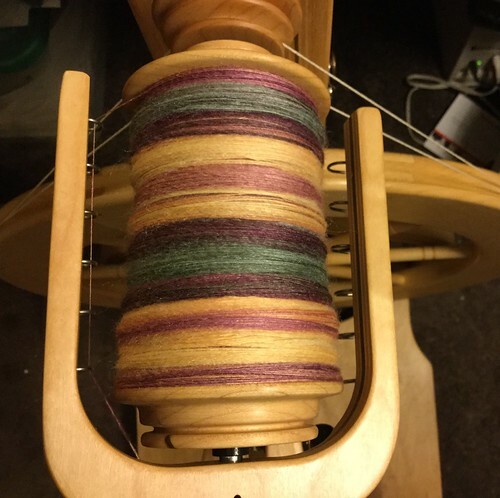 So, I haven’t quite finished the bump of ITW Gilmore’s Glorious Goods yet, but I still have a couple of hours of spinning time before I go to beddy-bye, so I will finish up tonight and start Project #2. I have really been enjoying spinning on my Matchless. The bobbin is nearly full. I think my next project will be a 3-ply (chain plied) fractal. I haven’t done one of those for a while. This entry was posted in Spinning and tagged Into The Whirled, Schacht Matchless, Tou. Bookmark the permalink.